The CWC LNG & Gas Summit took place in Tokyo, Japan on 19-20 February 2019 with participation and support from Japan’s Ministry of Economy, Trade and Industry (METI), JERA Co. Inc., Tokyo Gas and the Institute of Energy Economics Japan (IEEJ), along with more than 250 senior executives from across the LNG and gas value chain in both Japan and globally. 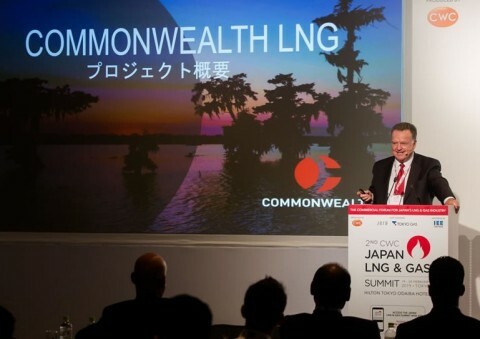 As one of the Summit’s primary sponsors, Commonwealth LNG had the privilege of participating and speaking at the event. During the lively panel discussion on Tomorrow’s LNG Supply Models, Paul Varello, CEO and President of Commonwealth LNG, addressed the critical need for greater innovation in the design and construction of the next wave of LNG projects. Citing the high construction costs and schedule delays that have negatively impacted the first wave of US LNG projects, Mr. Varello underscored how innovation in the design and construction of future LNG projects would be necessary to meet the evolving demands of LNG customers. In cooperation with engineering and design powerhouses TechnipFMC and Arup Group, Commonwealth will employ a fully-modular design and construction approach for the project’s liquefaction trains, auxiliary equipment and even its LNG storage tanks. In doing so, the company will dramatically reduce the amount of craft labor on the site, lower the capital expenditure (CAPEX) cost by roughly one billion dollars and shave a full year off the field construction schedule. Commonwealth LNG is an 8.4 mtpa LNG liquefaction and export project located on the west bank of the Calcasieu Ship Channel at the mouth of the Gulf of Mexico near Cameron, Louisiana. Commercial operations are expected to start in the first quarter of 2024.